Oklahoma has nearly 9,600 children in the foster care system. Fifty percent of the children in out of home placement are under the age of 5, with 30 percent of those children being infants and toddlers. Infants under the age of 1 are the fastest growing population coming into the child welfare system. We know that while families come into contact with the Child Welfare system during times of great stress of dysfunction, there is often hope for them to heal. We work with biological, foster and adoptive families. Sunbeam believes strongly in the value of biological parents and always include them in services when appropriate. 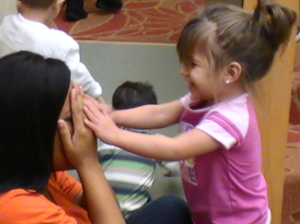 We offer specialized training to foster and kinship parents as additional support. Stress and trauma has a devastating impact on the brain development of an infant or young child negatively impact a child’s ability to form secure relationships. Research has shown that infants and toddlers who do not develop secure attachments produce elevated levels of cortisol (a stress hormone), which may alter the developing brain circuits and cause long-term harm. In addition, young children with unhealthy attachments are at much greater risk for delinquency, substance abuse, and depression later in life. Babies do remember stressful events and early intervention can be helpful in healing. Hope is possible for young children when services focus on supporting the relationships between them and their caregivers. ACEs are one way we think about what a child has experienced in their life and what sessions might focus on to provide hope and healing. Adverse childhood experiences (ACEs) are stressful or traumatic events, including abuse and neglect. They may also include household dysfunction such as witnessing domestic violence or growing up with family members who have substance use disorders. ACEs are strongly related to the development and prevalence of a wide range of health problems throughout a person’s lifespan, including those associated with substance misuse. We support foster, biological, kinship and adoptive families through specialized counseling services by Infant Mental Health therapists and training/education about the unique needs of infants and very young children who have experienced trauma.